Generic binary data files created by other MEG systems or analysis software. Generic ascii data created by other MEG systems or analysis software. Data files and Sensor array coordinate files are described. 4D Neuroimaging utilities for automatic creation of data and sensor array descriptor files are provided. transferred to the PC via ftp protocol. 2. Binary MEG/EEG data acquired with any other MEG system. (You must know the data format). type of MEG system is specified in a secondary configuration file, (gen_sen_loc.txt). 3. Data matrix in ASCII format with either rows or columns corresponding to the sequential time increments. This format should only be used for small time segments of data such as evoked response data. 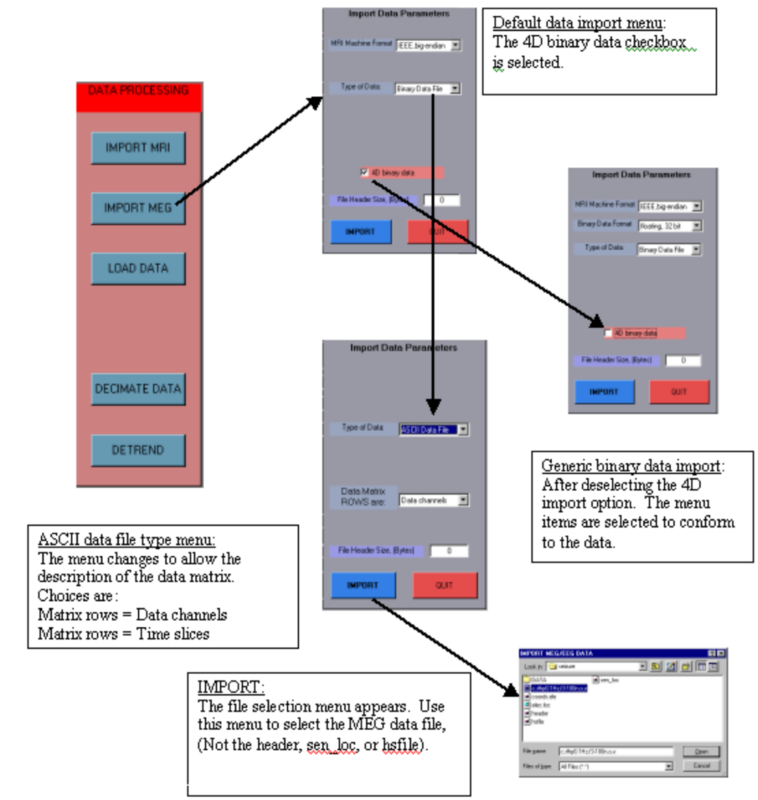 different set of generic datafile formats has been developed. 1. header.txt (channels id, location in time slice, and conversion factor to Tesla units). of these files in the DEMO DATA that can be downloaded with the MEG TOOLS for Matlab software.